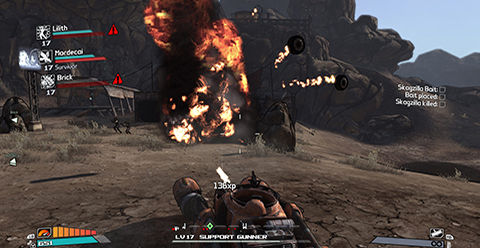 Borderlands 2 became a massive hit among players because of its shoot-and-loot systems, straightforward gameplay, striking art direction, and more than 17 million guns. It was able to surpass the success of Borderlands. Many players have seen the improvements from every version released; so they have high expectations on how the third installment will take shape. Below you’ll find necessary information regarding the updates of the much-awaited release of Borderlands 3. The Borderlands 3 trailer posted above displays the things we need to expect of the third installment of the well-loved game series. It poses an astonishing sign that Borderlands 3 is surely worth the wait. It shows the cel-shaded art style which was used on the previous versions. This art style was loved and applauded as it added the needed aesthetic on the tone of the games. Song choice is also commendable and every single scene has the swagger vibe which was the trademark of this game. Moreover, there will be more than billions of guns available as well as brand new modes of transport (i.e. motorcycle which has wheels that pass through over your body) and design locations which are realistic as ever. All your favorite characters are coming back like Ellie, Simmer Hammerlock, and Lilith to help you in your journey. We, the Vault Hunters, couldn’t ask for more. It’s totally an unimaginable level up from the Borderlands 2. Based on the developer trailer, fans speculated that the release date will be on October 1, 2019. As much I would like to confirm the details, we just need to wait for the official date of release from the creators and management of Borderlands game series. April 3 will be the latest date for the proper confirmation of the date of release of the much-awaited third installment of Borderlands. The Calypso Twins are the antagonists of Borderlands 3. They both have Siren-like powers and lead a cult called the Children of the Vault or COV (which was frequently used in the trailer). Troy is the name of the dark-haired male while his twin’s name is named Tyreen; who were both based on Greek mythology based on the trailer. A scene from the trailer shows Lilith being weakened with one of her Siren tattoos crawling away from the wrath of the Calypso Twins. She was zapped of from her Siren power and has seen Troy absorbing this by having Siren-like tattoos on his arm. Speculations have been raised that Borderlands 3 will revolve on the Calypso Twins, Troy and Tyreen, absorbing (or stealing) the powers of the world’s Sirens. Whatever the story goes, it will surely start on Pandora before you can control your squad to browse across multiple planets. As seen on the trailer, some older versions’ characters will be back and there will be a significant time gap which separates the events which took place on Borderlands 2 and the much-awaited sequel. Borderlands 3 will surely be as big (or much bigger) than Borderlands 2. Just hold your breath and excitement for a little time before it will be released worldwide.